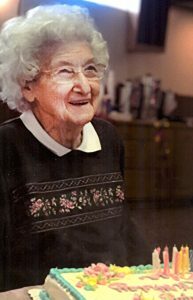 DAMASCUS–Elise (Steer) Buttermore will celebrate her 90th birthday at an open house on May 19 at the Damascus United Methodist Church, 260 Valley Road, Damascus. Family and friends are invited from 2 to 4 p.m.
Mrs. Buttermore was born May 16, 1928, to Edwin and Ana Steer. She is a graduate of Goshen High School, a lifelong member of the Damascus community and was employed at the former Haldi’s Shoe Store in Salem. She is most known for working at the Christian Book Store, located in Damascus, then moving to Salem. 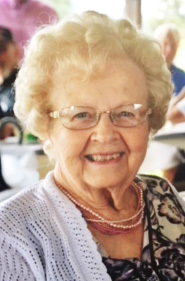 She was a member of the Magazine Club and is an active member of the church, teaching Sunday school, leading children’s music, singing in the choir, singing in a trio, attending Bible study and serving on various committees over the years. She enjoys time with her family and friends. Her children, grandchildren and great-grandchildren all have fond memories of her reading, singing and playing with them. She married her high school sweetheart, Paul “Skip” Buttermore on Dec. 23, 1945. They will celebrate their 73rd wedding anniversary in December. The Buttermores have two children, Paula (Kevin) Wartluft and Jim (Linda) Buttermore, five grandchildren and nine great-grandchildren. Mrs. Buttermore also has a brother Ed (Shirley) Steer. The family requests that gifts be omitted. For those unable to attend the open house, cards may be sent to P.O. Box 46, Damascus, Ohio 44619.